Aerial photograph of 1451, 1457 and 1459 Hamilton Ave. in Palo Alto,where Facebook CEO Mark Zuckerberg wants to expand his property and build four additional homes. 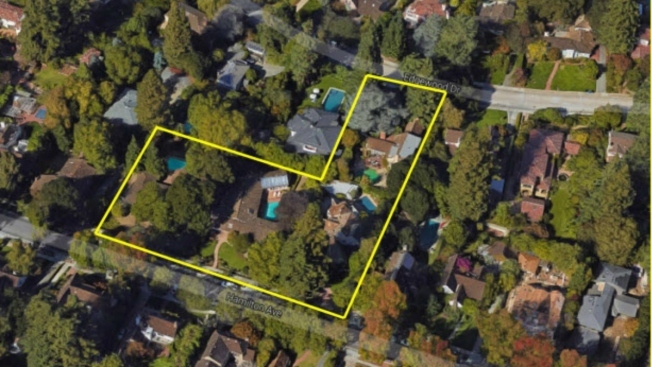 Facebook CEO Mark Zuckerberg wants to add on to his Palo Alto lot of land. But city officials are saying no. The 32-year-old social media guru was hoping to rebuild four homes around his original residence on Hamilton Avenue to round out his Zuckerberg compound to five homes on one lot. But his lofty plans were quashed Thursday during a regularly scheduled meeting of the Palo Alto Architectural Review Board. The board asked that the city planning director not approve that request. That's because, as one member explained it, the lot of newly constructed homes dampens the appeal of the neighborhood's polished allure. Zuckerberg's homes don't "conform to the neighborhood," architectural Review Board member Robert Gooyer told NBC Bay Area on Friday. The proposed homes would actually be smaller than the ones currently on the lot. Gooyer said that the board felt these smaller homes would then lead to other home prices in the affluent neighborhood to drop. Based on the project's proposal, a pair of two-story homes and a duo of one-story homes would have been replaced with one two-story house and three two-story houses. Overall, the new construction would cover a smaller footprint than the homes that were targeted to be torn down. Zuckerberg had purchased the residences on Hamilton Avenue and Edgewood Drive in 2013 for $30 million in an attempt to broaden his space for activities. "The idea is just to expand our client's capacity to enjoy the property: sharing time with friends and family, having more outdoor space to play," Kathy Scott, an employee with the Walker-Warner Architects firm working alongside Zuckerberg, told the Mercury News. "The current property is quite restricted and so this is just giving them more space for their residential functions." The Facebook leader also wanted to bolster his privacy after a developer reportedly tried to purchase one of the nearby houses and construct an abode that would be tall enough to peer into Zuckerberg's pad, according to the Mercury News. Some opponents of Zuckerberg's dream say his expansion yields unwanted construction and security headaches. And several critics wrote to the city to voice their objections. "I have to say it does bother me that one citizen can have that much influence on what happens in a neighborhood," neighbor Suzanne Rankin wrote in an email to the city. The architecture team working on the project is trying to reassure neighbors that the appropriate and respectful construction steps will be taken if the project is ultimately green-lighted. "The four homes will be built concurrently to minimize the duration of construction and enable staging that best protects the existing trees on site," Walker Warner Architects said in planning documents. "Building elements will be fabricated remotely to accelerate on-site construction and reduce impact on neighbors." The project's fate now rests with the city's planning director.